nvisioning the future is not an easy endeavor. For one brave (or crazy!) enough to attempt it, he or she might end up looking like a genius if correct (hopefully during their lifetime) — or a colossal fool (preferably posthumously) if proven wrong. Of course we at Phrenicea hope for the former, but we are not afraid to stick our necks out and put ourselves at risk for the latter. To ensure an adequate air of skepticism is maintained when viewing this site, we will present here the first of what we hope will be many predictions gone wrong — very wrong. "Lately, there have been multiplying signs that the long American romance with the big car may finally be ending. "A small, unostentatious car will be the workhorse for commuting and shopping. Car pooling will have to increase, despite massive psychological resistance to it. The one-occupant-per-car habit is simply too expensive to be continued. The heavy car will linger as a limited-purpose, special-use auto, but not again become the basic American vehicle." 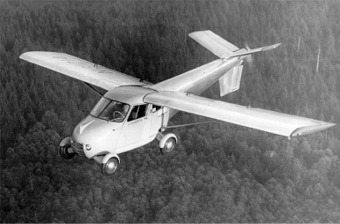 "You can buy an Aerocar today and become a pioneer in one of tomorrow's most exciting forms of travel. Cost of the first few vehicles is high, but watch cost drop as production climbs!" 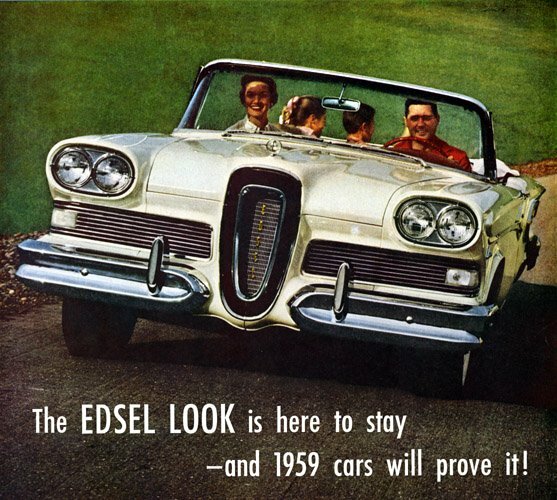 — and the 1959 cars will prove it!" "The only thing different is the hair, as far as I can see. I give them a year." - Ray Bloch, musical director, "The Ed Sullivan Show"
Non Sequitur © Wiley Miller. Dist. by uclick. Reprinted with permission. All rights reserved. "Welcome to a journey into the future — a journey for everyone today, into the everywhere of tomorrow..."
General Motors' futuristic pavilion — Futurama — at the 1939 New York World's Fair, was a huge hit. 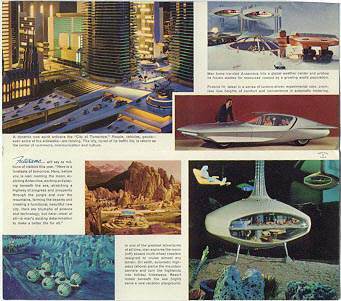 So when New York again hosted the fair in 1964, GM went all out with the fabulous Futurama II exhibit, arguably the best attraction at the fair. For those lucky enough to experience the ride, it showcased a utopian-like vision of the future using incredibly detailed, miniature working models. The vision was based not on Man's good will or worldwide political harmony, but on omnipotent technology. "A dynamic new spirit enlivens the "City of Tomorrow." People, vehicles, goods — even some of the sidewalks — are moving. The city, cured of its traffic ills is reborn..."
"Man turns ice-clad Antarctica into a global weather center and probes its frozen wastes for resources needed by a growing world population." "...[T]urbine-driven environmental cars, promise new heights of comfort and convenience in automatic motoring." "On earth, automatic highways pierce the mountain barriers and turn the highlands into holiday hideaways. Resort hotels beneath the sea serve a new vacation playground." Now that your appetite for "all things future" has been technologically whetted, take a vicarious trip through the Futurama exhibit by clicking here! Read the entire transcript of the audio narration accompanying the ride. Listen to a recording of an actual ride through the exhibition hall. Let your imagination take you to a world that was supposed to be here by now! "Nobody knows. I don't make any assumptions about the future." "Some day, the atom, or one of its currently little known by-products, may even drive your own personal car! Does the idea sound fantastic? "A professor of mechanical engineering at the University of Michigan, who asks to remain nameless, believes that some day atomic cars will be commonplace. In fact the illustration on the cover of this issue of Motor Trend is based upon his vision of such vehicles. To him, the fact that horses and buggies gave way to gasoline-powered cars during his lifetime is proof enough that atomic cars are in America's future. "So, on this April day of 1951, who is to say whether an atom car is desirable, practical, or feasible? A few decades ago who would have said that the automobile was feasible?" "I am a HAL 9000 computer, production number three. I became operational at the HAL plant in Urbana Illinois on January 12th 1997"
Way back in 1968, all sorts of futuristic scenarios were painted with a broad brush of technological optimism. 2001: A Space Odyssey was sophisticated science fiction based on the predictions of respected scientists. Computers with human-like abilities did not seem out of reach. "HAL's level of achievement has not been attained. To make a computer intelligent enough to pick up the real complexities of human speech... that's going to be pretty hard to do. I'm not sure it'll ever be possible." Here Come Cars Without Wheels! "You'll ride low and fast on a bubble of compressed air, in fantastic new 'sleds.' They whoosh across fields, swamp, water — anywhere — at speeds that could match airplanes." "Imagine a car without wheels,RealityCheck! skimming four feet off the ground across roadless terrain. They slide on compressed air blasted down by a propeller. Freed from friction with the ground underneath, they zoom forward at airplane-like speeds. "They threaten to turn transportation inside-out, giving you a sports car, speedboat, half-ton truck and back-pack helicopter all rolled into one. There is no restriction on speed. The designers are thinking about 150 mph over water, 500 mph over land. "And the big thing: It should be cheap. A breakthrough like this could shake up living patterns here and everywhere else. Any stream or stretch of open country becomes a highway, any beach a harbor. Lonely farm families will get to town, winter and summer, as easily as if they lived alongside the freeway. Commercially, the deep-water harbors that are great port cities' richest assets would be obsolete." "Some apocryphal Victorian, so the story goes, looked at the rate at which the number of horses on city streets was increasing and assured his peers that their capital would soon be knee-deep in horse manure. He got it wrong, largely because he failed to predict the imminent rise of the automobile. That brought its own problems, of course, but the point was that Victorians were blindsided by the future — which, as any would-be Cassandra soon learns, is seldom what it appears to be." Alas, cancer is still with us." So why is everyone still working so hard? "[By 1985], machines will be capable of doing any work Man can do." Gee, this kind of arrogant optimism sounds familiar. Today's inflated predictions center around computer technology. To learn about one of Simon's most galling contemporaries, Ray Kurzweil, visit "Chiphead." History does repeat itself!